The images were developed utilizing 4x5 black and white negatives, analogue and photographic printmaking processes including photogravure intaglio, lithographic and chine collé techniques. The type is set in Baskerville. The images were printed on Honen Japanese Rice and Arches Cover White paper. This edition is housed in a portfolio case covered in Japanese black silk and inlaid with an English matte book cloth. The portfolio case was made by the Portfoliobox Company in Rhode Island. 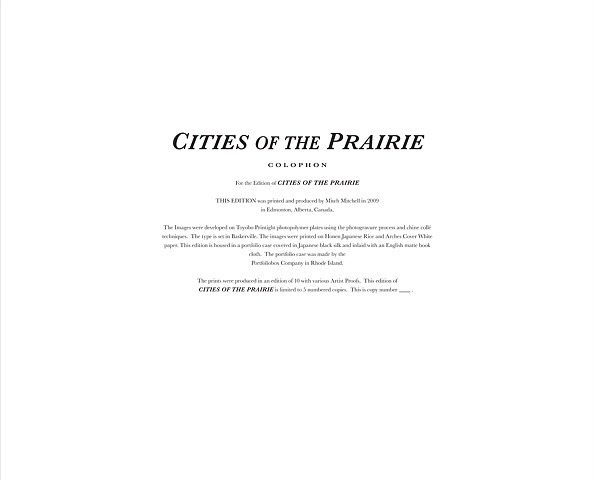 CITIES OF THE PRAIRIE is limited to 5 numbered copies. This is copy number ____.